With the Christmas holidays approaching quickly, many homeowners will begin to pull Christmas decorations out of the attic or basement to decorate. Christmas stockings are certainly a staple for many people, and we offer a great Christmas Stocking Hook Kit that makes hanging stockings safe, quick, and easy. This kit offers a total of six feet of track that can be mounted under a fireplace mantel, or under a shelf or door frame, along with six hooks that easily slide from side to side. Because the track is a very low profile, it can be left mounted year round. The hooks can be removed or replaced. The mantel track is available in white, black, brown, or gray to blend nicely with most fireplace mantels or other mounting surfaces. By using these Christmas Stocking Hooks mounted on a track, you eliminate the need to use those heavy mantel toppers to hang stockings. These metal stocking hangers can easily be pulled down by small children, risking serious injury. In fact, that was the reason the manufacturer designed the product in the first place - to address an obvious safety concern he encountered with his own toddler. This article on MSNBC from last Christmas highlights the exact issue, demonstrating that heavy objects perched above a small child's head, with an enticing stocking hanging down within reach, can result in injury. Ultimately, it's up to families to scrutinize holiday decorations for possible hazards, especially dangers to babies and young children. Shannon Wilson, a 33-year-old mother from St. Augustine, Fla., wished she’d thought more carefully about the heavy, star-shaped metal stocking holder she placed on her mantel a week ago. 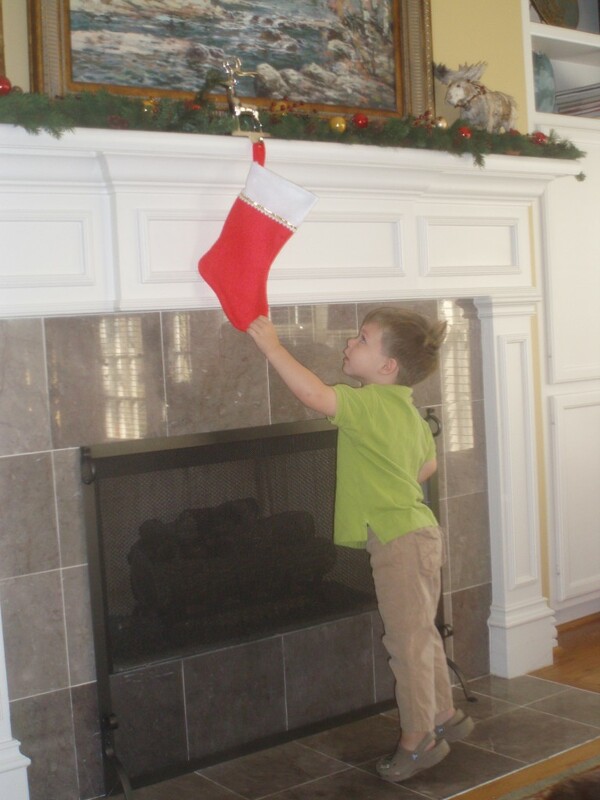 Within an hour of her hanging the stockings, Wilson's 18-month-old son, Baylor, had pulled the holder off the mantel. “It just nailed him, right on his forehead, right between the eyes,” she said. In another blog post, a similar incident occurred where a mantel top stocking hanger fell on a child causing injury (excerpt below). He also managed to have his first scary injury the day after Christmas when he decided to pull on his stocking which was held in place by a nice, heavy, metal stocking hanger off the mantel. Luckily he pulled at an angle so it grazed off his head and just left a nice scratch. It was a bit of a heart stopper for a moment there as it seemed to happen in slow motion and no one could stop him before it fell. Beyond the safety concerns, the use of a track to mount the stocking hooks under the mantel frees up space for your favorite decorations. The fireplace mantel is the centerpiece of many homes, and it's great to be able to feature you favorites center stage. Because the hooks slide from side to side, it is also simple to rearrange stockings as guests arrive or depart during the holidays. By adding additional hooks, you can also enhance the look by hanging additional ornaments between the stockings. No more tacks, cup hooks, or tape. Simply put the track up once, and remove and replace the stocking hooks each time you need them. You may also find that once you have the track up, you will used to to decorate throughout the year. Ideas include hanging birthday cards, banners, or cardboard cutouts for various occasions. Slid the hooks into the end of the track, and your can hang decorations in seconds, without any tools. As mentioned above, the track can be left mounted year round, so using it any other time is as simple as sliding the hooks back into place via the end of the track. These Christmas Stocking Hanger Kits contain six feet of track, six sliding hooks, two end stops (optional) and mounting screws. Installation is as easy as cutting the vinyl track to length of needed, drilling small pilot holes for the screws, and using a screwdriver to insert the screws into the fireplace mantel. Six packs of replacement hooks are also available if you need more than six or misplace them over the course of the year. We have gotten excellent feedback from customers on this product and are sure you will be glad you ordered one too! 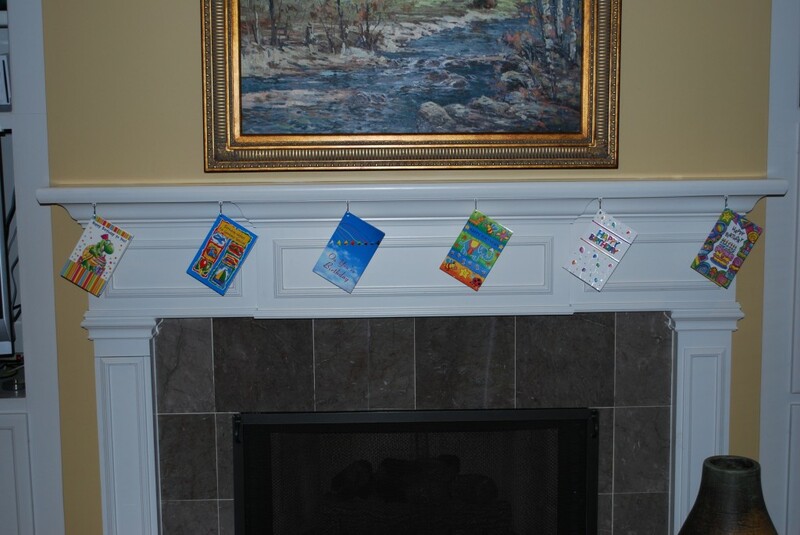 If you do, please share a photo of your mantel decorations that we can add to our our gallery. My (then 18 mos) son had to get 3 stitches after he pulled a stocking hanging from a pretty and heavy metal stocking hanger off the mantel. It cut him right under his eye! I felt foolish for not anticipating that of COURSE he would pull on his stocking and now, whenever I see those heavy hangers for sale in stores, it gives me chills. He's lucky he didn't lose an eye or get killed!!! watch out for the stocking holders. my 19 month old grabbed & pulled the stocking down. he almost got hit by the heavy holder! we removed the stockings and hung ornaments instead. Christmas stockings can be a hidden hazard if they are hung with heavy stocking hangers, which can fall on and injure younger kids. Be careful of heavy stocking holders that toddlers and preschoolers can pull down on top of themselves, which is becoming an increasing common hazard as use of these heavy stocking hangers become more popular. Lisa- That is great information. Thanks for adding it! It is awfully easy to overlook the hazards of Christmas decorations, and safely hanging Christmas stockings is no exception. 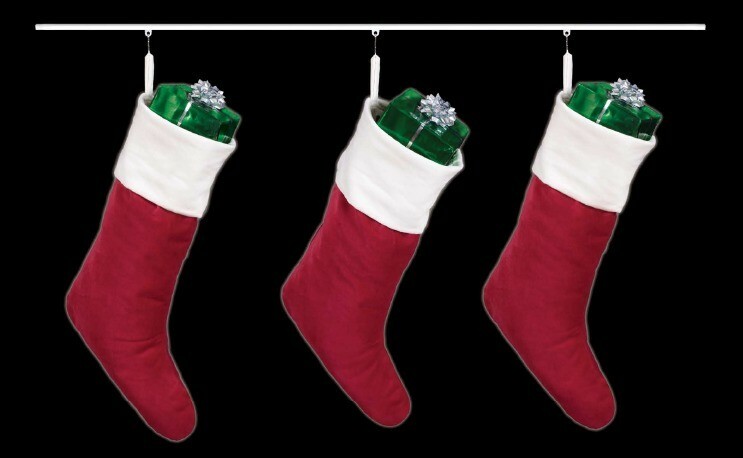 We think this Stocking Hanger meets a definite need. We got one of these and love it. The best feature to me is the ability to slide the Christmas Stockings to each end of the track and away from the fireplace when we have a fire burning. I am always worried about the heat damaging the stockings or even catching them on fire. With these sliding stocking hooks, we can simply move the curtains away from the fire, and then rearrange them once the fire dies in the fireplace. The stocking stay on the mantel, but are moved as needed. The Christmas stockings look great hanging on these hooks. This product is a winner...safe and attractive.